Call me dumb, but I simply cannot get this to work. and here is my form builder setup..
Can someone help with what I have done incorrectly. I have read and re-read the forum posting that explains this. mmm, here's where my understanding could be wrong. 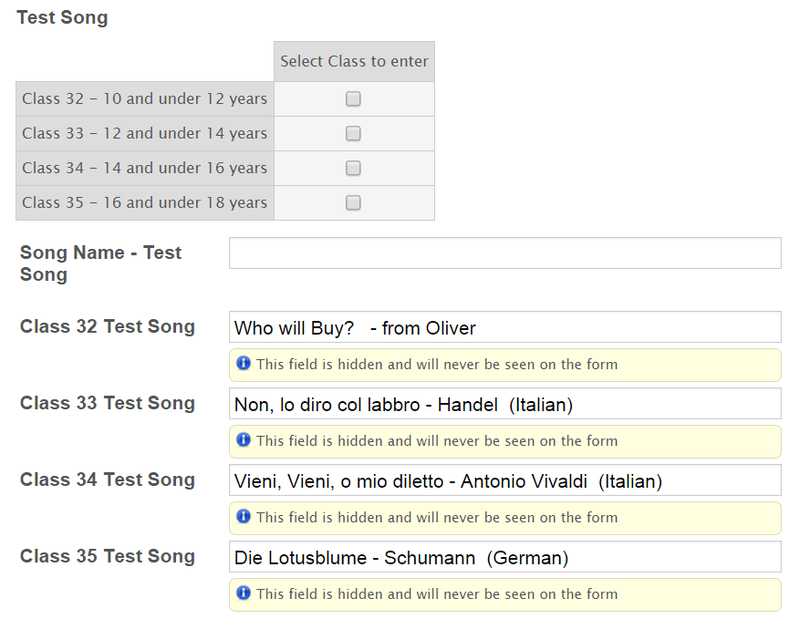 I am assuming that if the checkbox next to "Class 32 - 10 and under 12 years" is checked, then the value for the field "Test Song" is "Class 32 - 10 and under 12 years". 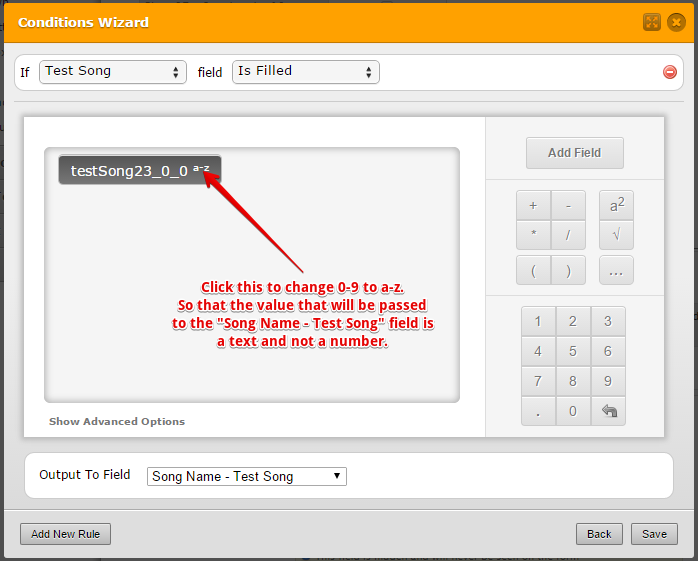 So this is what I think I have tested for and if it is true, I want this value to populate into "Song Name - Test Song" field. I have the feeling my understanding of this is wrong. 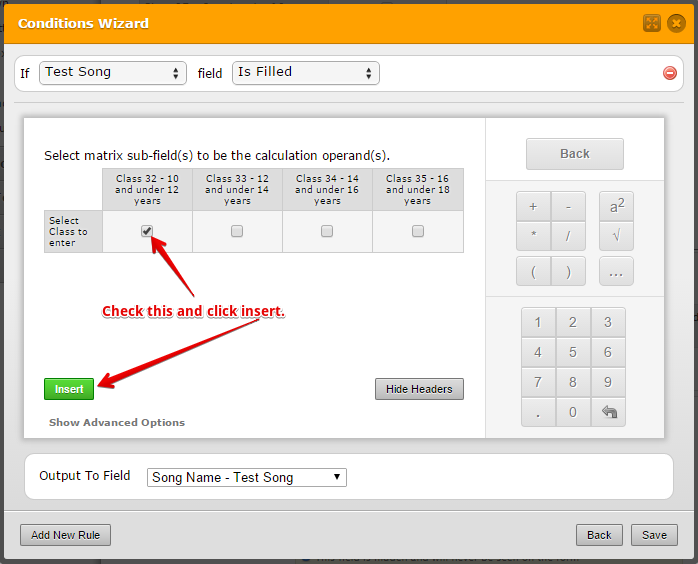 So I tried the same thing but to just show the appropriate Test Song for the class selected and I could not get this to work either. 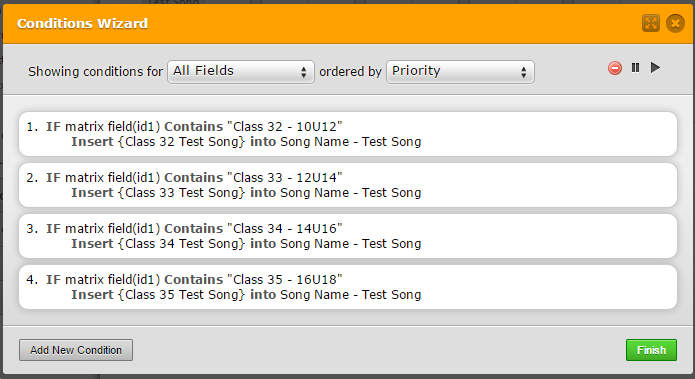 The only thing I could get to work was to show the Class 32 Test Song field if the "Test Song" field was "Filled". But then if Class 33 was ticked, of course this logic fails. I'll have a sleep and hopefully tomorrow all will come clear. I hope this helps. If you need further assistance or you need any clarifications with the instructions above, kindly let us know and we will be glad to help you anytime. Thank you. Many thanks Mike_G for your comprehensive answer! However, the concept is not quite as I was wanting. 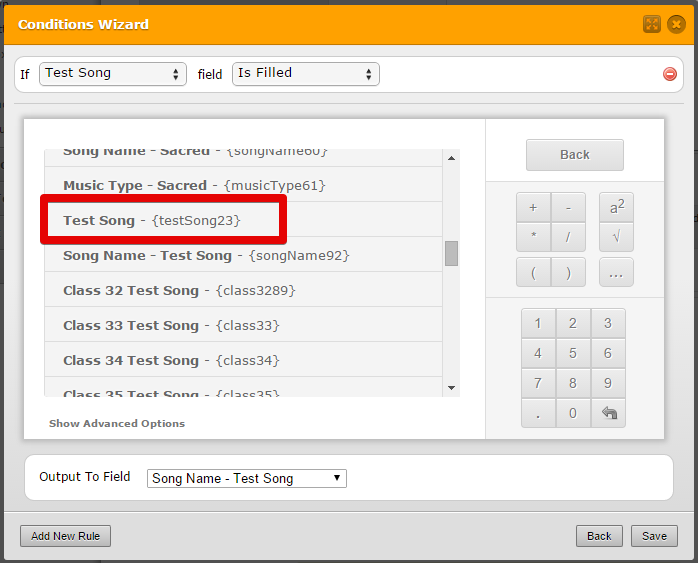 When I select one of the age-group selections, I would like the Song Name - Test Song field populated with the corresponding song name read from one of the hidden fields as noted in my original post. As an aside, I was going to try and do a summary list of the classes entered on a subsequent page which would then show the fee for each class, the Administration fees and then total everything up. 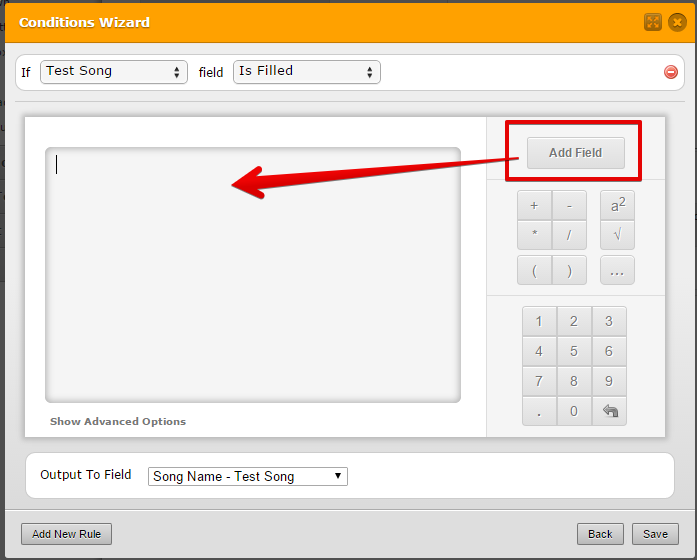 It may be that I just need to do every class selection as a separate text box and make the summary form as the selections are made by hiding all unwanted fields. You are a champion. many thanks once again. I am not sure if your problem is solved? 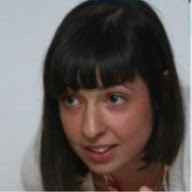 If not can you please quickly summarize what you want to achieve and we will be glad to assist you. In the end, after some thinking, I have decided to approach this another way by not using the matrix tool. I am new to this cleverness, so it has taken a wee while to soak up all this information. 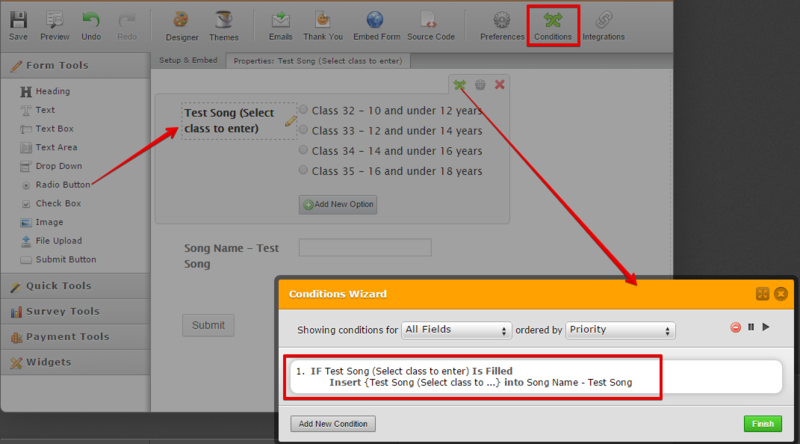 To answer your question, I see what is possible with a condition on this form, however I wanted the song name to be populated with the song name not the class title. I have changed my thinking to having each class in each age group presented as a text box. However, as soon as someone enters their age on the first sheet, I want to hide all class entry fields that don't relate to that age group. This would involve at least 1 condition for each age from 8 to 10 where each condition could hide around 45 fields. Is this likely to be too much for a form? 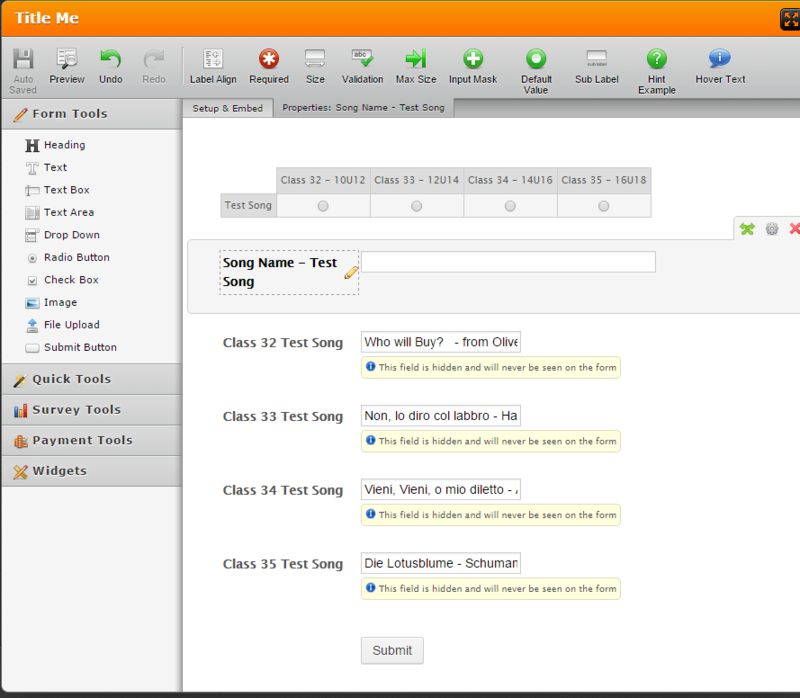 PS I am VERY impressed with the support forum at JotForm. This would be the most responsive forum that I have encountered in my 30 years in the digital age. To answer your question, "Is this likely to be too much for a form?" Going back to your initial concern. I believe this is what you would like to happen. I hope I was able to help. Let us know if you need any further assistance and we will be glad to be of help. Thank you. 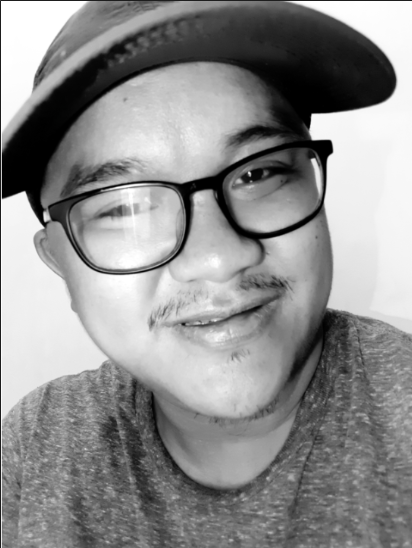 You guys are amazing! So helpful.